Good evening ladies and gentlemen. This afternoon we received word of the sad passing of Paul E. Sigmund who was one of the longest standing Hands Together Trustees and a tireless friend and supporter of the organization for over two decades. Paul's dedication and support of Hands Together will be sorely missed, as will his friendship and guidance. Paul E. Sigmund, husband of the former Princeton Borough mayor Barbara Sigmund, died this morning at the University Medical Center of Princeton at Plainsboro due to complications from pneumonia, family friends confirmed. He was 85. Sigmund was a professor of politics at Princeton University. His scholarship focused on political theory and comparative politics. He wrote numerous books and articles on Latin American politics with a focus on income inequality, multinationals and the military. He is the author of “The Ideologies of the Developing Nations”, “Natural Law in Political Thought, The Overthrow of Allende and the Politics of Chile, 1974-1976,” and “Liberation Theology at the Crossroads.” He was the translator and editor of the Norton Critical Edition of “St. Thomas Aquinas on Politics and Ethics.” He also co-authored several other books. He began teaching at Princeton in 1963 and helped found the school’s program in Latin American Studies. He served as the program director for seven years. He was a fellow at the Woodrow Wilson Center for Scholars and the Institute for Advanced Study, and received fellowships from the National Endowment for the Humanities and the Harry Frank Guggenheim Foundation. l to r: Paul Sigmund with fellow HT trustees, Tom Gilligan and John Clarke visiting our school in Ti Desdunnes Haiti. He served on the boards of Georgetown University and the Carnegie Council on Ethics and International Affairs, and was an active member of the Council on Foreign Relations. In 2001 he was the first American academic to receive the Bernardo O’Higgins Order of Merit, awarded by the Chilean government for outstanding accomplishment. Sigmund earned his doctorate from Harvard University, where he taught for four years before coming to Princeton. He earned his bachelor’s degree from Georgetown University. Princeton was so meaningful to him because he was a teacher throughout his life more than anything else, and this was a warm and welcoming community to him ...He was so grateful that he could teach to and learn from so many generations of Princeton students. After my mother died, he had a supportive intellectual community to help him. He was somebody who really wanted to talk to you about interesting things, talk to you about your life and share the learning experience. People walked away from a conversation with him knowing more and feeling better than they did walking into the conversation. He had students and professors living with him on the third floor of our house for 20 years after our mother died because he wanted people to have dinner with and have intellectual conversations with ...You never walked away from a conversation with him feeling like you were belittled or put down, but rather like you were listened to and heard. In mid-April we broke ground on the construction of the HT/PAP Archdiocese Monseigneur Charles Benoit Music School. "There are very few programs and even fewer schools dedicated to teaching and performing music. It's really hard to believe in a country so filled with artistic ability. Our dream is to build a school dedicated just to music, and develop the God-given talents of our students and the students in the Port-Au-Prince Archdiocesan schools. This school will provide the training and organizing of select students who demonstrate the talent and willingness to learn and perform music. Students from the Becky DeWine School and the dozens of diocesan middle and high schools shall be eligible for these programs. In the not too distant future we look forward to inviting musicians from the U.S. to come and mentor and perhaps even perform a school concert with our students!" says Doug Campbell, executive director of Hands Together. Fr. Brillere Aupont, Port-au-Prince's Diocesan School Director, brought the idea of the Msgr. Benoit Music School to Fr. Tom and Doug Campbell in late October, explaining that the diocese secured the land and found teachers for the school but lacked the funding and sponsorship to make it happen. We offered to fund the project and join hands with the Archdiocese to bring music into the lives of our students. "Music is a gift from God," says Fr. Tom. "It can do so much to heal divisions, to reduce conflict, to teach harmony and cooperation with one another. These are the greatest challenges that face our students and their families and we believe that music can be a great tool for combating jealousy, poor self esteem and discouragement. Music is hope." The school is located next to the St. Yves Parish on Delmas 5. The building contains 6 classrooms, offices, performance auditorium and large gathering spaces. Staffing - a complete faculty would include over 40 teachers. We realize this may take some time to build, but we identified all the needed staff and appropriate wages. Monthly cost for full staffing, $30,000 x 8 months $240,000. This past July 4th, we held a graduation ceremony for our Becky DeWine school's first graudating class of 129 students. Without the dedicated efforts of Fran and Mike DeWine and our DeWine family of donors, we would not be able to share this good news. Both were present at the ceremony and Attorney General Dewine gave the closing address. Mary McCarty, staff writer for the Dayton Daily News, who has written much on Hands Together, talked with the DeWine's on their experience. You can find her complete article here. The ceremony was presented by Bishop Mesidor WaWa (Diocese of Fort-Liberte) and contributions were provided Bishop Yves Marie Peon (Diocese of Gonaives). Fr. Tom Hagan, president of Hands Together, delivered a message to the graduates and parents discussing the great mile stone these children have achieved and reminded the gradutes of the fundamental belief that they are truly loved by God. "From the creation of the school to surviving the earthquake, hurricanes, cholera outbreaks, and the everyday violence of Cite Soleil you have formed a community in God’s love." Doug explained that the "time for receiving was coming to an end and the time for giving has begun." He has implored the graduates as they continue their successful journey that they always remember where they came from and the support and hope Hands Together has brought them, and reminded them they are always welcomed members of the Hands Together family. Attorney General of Ohio Mike DeWine gave the closing address. Our 2013 Annual Report is now available in PDF format. Click here to download. The Hands Together 2013 Annual Report provides the most current information on our work in Haiti. It's a great summary of the work that began 28 years ago and a testimony to the sacrifice, commitment, and vision of Fr. Tom Hagan, Hands Together Founder and President. We hope that by sharing a little of our story with you will strengthen the bond between the many struggling people of Haiti and all of you who have done so through your prayers and support. Most of all we wish to leave you with an honest, accurate, glimpse at the harsh reality of work with the poor. “Wherever the very poor are, that is where we will be. We will follow them and stand alongside them.” Fr. Tom said in response to questions about long-term planning from a recent visiting delegation from the United States. This, of course, is not our entire long-term approach, but it truly reflects our spirituality and mission when considering what we are doing in Haiti. And it is the foundation upon which all our projects rest. Fr. Tom, in a moment of honesty summed up his feelings about working in Haiti, 'I don't like it here in Haiti and I never did but I am not ready yet to "throw in the towel". I have a dream that our schools will be good examples to others of what education should be. I still have a dream that our schools will be extremely clean and orderly, with many good programs and activities. This dream keeps me getting up each day and it also keeps me thinking young." As "Carnival" ends, marking the beginning of Lent, our students returned to their classes, today - February 14th, after a few days off. We have set many goals for this Lenten journey, hoping to purify and simplify things within ourselves and within our projects. As Fr. Tom writes, 'There is so much here to do. I am setting up a teacher's committee, with representatives chosen by their peers, in hopes that we can have a system for dialogue and for resolving grievances and conflicts. I will be working on modified contracts that require teachers to assist in classroom and cafeteria monitoring, something we really need as there is too much disorder now. I am trying to set realistic goals for each day!" Hands Together's Becky DeWine School contains 5,000 students dispersed among 8 separate campuses in 7 different neighborhoods. All of the locations are considered part of Haiti's largest and poorest slum, Cite Solei, where the poverty and violence make it impossible to really implement any consistent programs. Here is a recent email from Fr. Tom to Doug Campbell about the typical daily situation he faces in Cite Soleil, "Yesterday, we had to close two schools early because of all the shooting. It has intensified over the past two days as two wars are going on simultaneously. Solei 19 against Ti Haiti and bran Neuf against Druillard. Two who were shot are participants in our Dismas program. If it keeps up, we wont have to pay any salaries to these guys because they will all be shot." It is with this constant instability and unrest that we open the gates of our campuses each day - praying for God to help us through another day. continue to feed 150 elderly each day, with last year's high school graduates helping out. funds for supporting alumni graduates to come back and help and teach - giving stipends. Thanks to the generosity of the DeWine family, we now have a special scholarship program for our high school graduates. Hands Together forged a partnership with the University of Notre Dame Haiti - and their 8 different colleges, so that scholarship recipients would receive 4 years of tuition, room and board, contingent upon a recipients successful admissions into the University. Currently, there are 28, 2012 graduates competing for this merit based award. All candidates must work for 6 months - teaching at our barefoot schools or helping run our elderly feeding programs. In February, Senator DeWine and Fran DeWine met with all candidates and interviewed them. Thanks to strong leadership from the administration at our St Ann campus - we have a very well run middle school with a great potential for many improvements and more advanced programs. Like the high school, we implemented a strong parent/community committee and started a student council as well. Hands Together has worked hard to renovate the existing St. Ann church that is adjacent to our school complex - and it is here that we hold parent rallies, hold Sunday Mass, and even hold mini retreats and teaching sessions for our gang outreach program. We are trying to increase our Catholic presence and resurrect a lagging Catholic faith presence in our schools and in the neighborhoods. Fr. Tom speaks to parents and community at an anti-voilence rallly organized by HT and held at the St Ann Church. install an artificial turf field at St. Ann that will serve our entire Becky DeWine school population. We estimate that it would cost about $200,000 - with our Dismas and local people doing much of the labor. obtain funding to expand our "barefoot school" outreach here - to pay for additional school meals and learning materials - $18,000. Roof top and school gardens. "If we can begin when they are young, and instill a solid moral and intellectual foundation, we can help change an entire generation and eventually transform the Cite Soleil slum, and the minds of our students will be open and strong enough to imagine a totally different kind of life. A life of service, and responsibility. That is why it is so important to have good quality pre-school and elementary school programs," says Fr. Tom. In September, we started an internship for our high school seniors for them to gain real life, hands-on experience in the world of broadcasting and communications. Hands Together supports Radio Boukman with an annual operating grant and we feel that it is a great example of a locally created and run project. This past summer, Fr. Tom organized 9 groups of 11 young men with ties to the gangs of Cite Soleil and created work projects for them during July and August. This experiment proved very successful and demonstrated that with a little effort, something can be done to alter the lives of those who many consider "beyond hope." Dismas worker supervises recreation at St Veronica. Dismas is an outreach to the at-risk youth and gang element in Cite Solei – named after the thief on the cross next to Jesus, who at the end of his life, experienced Redemption. The central message here is that all human life is precious and redeemable, and that with God’s grace, anyone can change. We are trying to change the hearts and minds of the young people who’ve been labeled vagabonds. This project is primarily about human dignity, about instilling hope and self-worth. It is not a “job-creation” program, but an outreach linked to the Church and our educational centers “schools” in particular neighborhoods. Duration: Project begins January 1st and ends April 30, 2013 . Max participants: - 120 Structure & Operations: We will create “dismas teams” of 10 participants – each group headed by a captain. Project will start on January 1st – and continue until the school year ends on June 30th. Fran & Mike DeWine, Bill Darling, and Tom Hiltz visit a barefoot school classroom. In early November 2012, Fr. Tom noticed many school aged children wandering around nearby our campuses, but not in school. He discovered that there was an entire population of kids (ages 8-14) who have never been to school and as they get older, their chances of ever learning to read and write diminish rapidly. So we created our "barefoot school" to target these youth. Each day we feed and provide literacy formation to 255 young people who have never been to school - an might never go to school. We run a barefoot school at our 3 largest campus centers. The participants come at 1pm for a daily meal, and then they sit through 2 hours of basic literacy training. What is unique about this project, is that the teaching is done by our recent high school graduates as part of their DeWine Scholarship eligibility requirements. As more and more students graduate from our high school, we can see the great impact our alumni will have on the communities of Cite Soleil. During this time of Advent we are called to wait – it is a time of exile and we await a light to come and dispel the darkness. Certainly we experience this at a profound and harsh level with our work in Port-au-Prince. The email above from Fr. Tom really captures the struggle of working with the poor in Port-au-Prince. It is a constant pressure, especially from those who we simply cannot help. It is a problem that cannot be solved by “giving more”. During this time of Advent we are praying for God to help us with these challenges -- to help us avoid discouragement or giving up, to see the “light of world” even when it seems dark. So this Christmas we ask that you say a little prayer for us and know that we are always grateful for everyone who is part of our small work. During October and November violence in Cite Soleil increased, with different groups fighting one another and creating serious safety and security problems for schools and clinics. The instability became so disruptive, that we had to close our schools down several times. This prompted us to hold a large “anti-violence” rally at the St. Ann Chapel in late November. Nearly 3,000 people, students, parents, staff and community leaders filled the St. Ann Chapel to show their solidarity and the cry to stop the violence and allow the children to go to school without fear or danger. Representatives from the Becky DeWine School Parents committee (mother and a father) pleaded for an end to the fighting. Hands Together School leaders, Doug Campbell, and Fr. Tom Hagan all spoke to the large crowd. 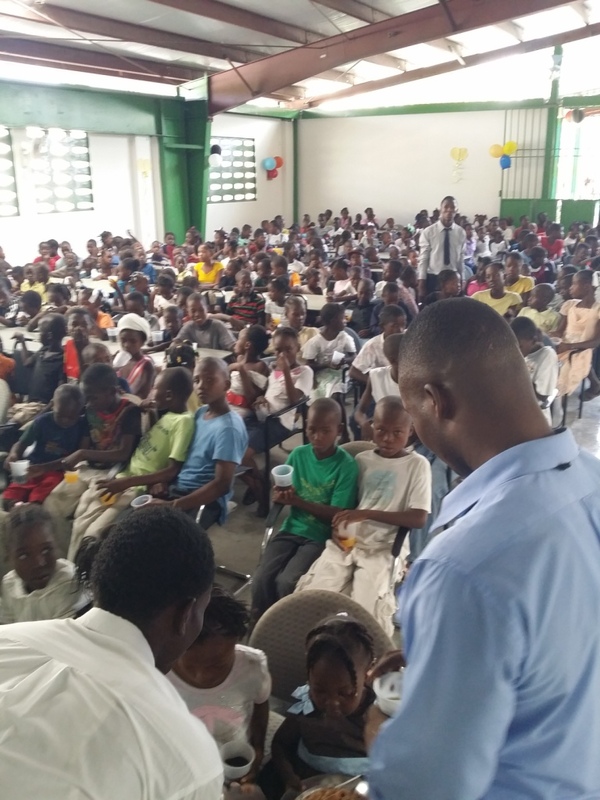 The event ended with an address from the Haitian Secretary of State and the chief of Police – pledging to properly dispatch police to school sites and insure safety for the Hands Together schools in Cite Soleil. “We needed to place this problem of violence into the hands of the community. We needed to shed some light on how bad things have become and challenge every parent and every community leader to spread a message that violence cannot conquer violence. Fr. Tom did a wonderful job of communicating that God not only loves everyone, from the children to the gang member, but that God forgives everyone. We needed to establish a starting point for moving forward and scrub out any ideas of vengeance,” said Doug Campbell. K- 12 Education – The biggest challenge is trying to run the high school. Our fundamental and middle school runs pretty well, but our high school gives us constant problems. The high school demands a huge number of special teachers, and tons of books, and computers, equipment. We try to provide a comprehensive education – intellectual, spiritual and physical. Barefoot Schools – There are countless children of all different ages who never really went to school. We’ve enlisted the help of our recent H.S. graduates to work with this group from 1-3pm, each afternoon. We provide a simple meal and some basic literacy training to about 600 participants, but this could easily double overnight if we opened it up further. Parent Associations – Every school is designed to serve the community where it’s located. We’ve done a poor job of fostering responsibility and support from the parents and local leaders. This year, we created “parent associations” with 10 parents from each school, meeting every Sunday to discuss the needs, problems and programs of the school. If there is a problem of violence near the schools, then we turn to them to help us address it, if there is a maintenance problem, or a theft problem, then we must include the parents and the community in our response. Project Dismas – There are thousands of young people in Cite Soleil (ages 19-28) who do not work and who naturally end up in gangs. Every neighborhood has this element. We began an outreach to these young people and in the past we’ve had some limited success in helping some of them change the direction of their life. The project is named Dismas - after the thief on the cross next to Jesus, who at the end of his life, experienced Redemption. The central message here is that all human life is precious and redeemable, and that with God’s grace, anyone can change. We are trying to change the hearts and minds of the young people who’ve been labeled vagabonds. We created “dismiss teams” of 10 participants – each group headed by a captain. Each team helps at a school location – our schools should be the anchor from which we outreach to the community. Build and care for a school garden – at every sight. Radio Bookman Interns – Each year we provide a grant to help Radio Boukman – a grassroots radio station that was founded by past HT employees – and provides Cite Soleil with excellent news, spiritual radio, music and educational programs. In November we started an intern program for our H.S. seniors, where they spend afternoons learning the basics of journalism and radio broadcasting. Mobile Clinic – HT trustee, Dr. Jim Dellavalle spent December 4 -14 helping Dr. Fanfan with our mobile clinic outreach program. Each day, about 125 people came to the clinic, which circulated around the different zones of Cite Soleil.